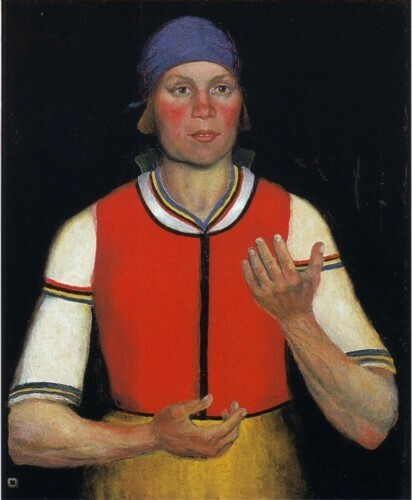 "Perhaps the most astounding, the most moving work, marked by tragedy, is the 1933 Self-portrait in the Russian National Museum. The basic structure of this painting is the iconographic archetype of the Mother of God Hodighitria, that is to say the Theotokos making a gesture of the hand towards her Son towards the Way; It is "Hodighitria", the one that shows the Way, The Way. Well, Malévitch took this form to represent himself. There is no futuristic irony, which the artist was also fond of. Just this serious humor that characterizes him throughout his work. He has naturally identified himself with the One who shows the Way, and has fittingly appropriated this metaphorical model: and the Way, the path to which Malevich points and which is obviously not represented; how are we not to think that it is the objectless world toward which he has worked and which is symbolized by a black square within a square, the signature of several works of that time. The distance of the thumb from the other fingers gives the outline of a square. The structure is geometric (the white triangles of the collar, black of the upper garment, contrast with the rhythm of the green stripes). The alternation of green and red is a constant of the Malevichian range. 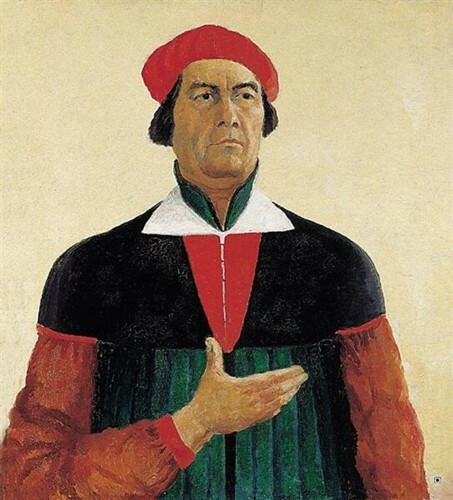 Malevich represented himself as a man of the Renaissance, a reformer. The tragedy and the greatness of this self-portrait comes from this gesture which designates Absence. This image that Malevich left us at the end of his life summarizes all that Malevich was aware of having brought to the history of painting, with a more acute feeling of misunderstanding, loneliness, dereliction, feeling also that man is reduced to a gesture. This is evident in the Worker  who is actually a "maternity" from which the child is absent. This thought of Absence is that of Suprematism, which recognized the world emptied of objects as the manifestation of true reality. In post-suprematism, the absence of true reality emerges in a desperately tragic expression. True reality is designated but from now on it escapes man."